I have been blessed to be able to travel to Myanmar (Burma) several times. I have been able to teach at about a half dozen seminaries and Bible schools. Of course, all the churches want to hear an American preach. With all of this going on during the trips; along with counseling, and evangelizing; it is a wonder that I have seen any of the culture of the country. I have made a concerted effort to learn as much as I can about the nation, the people, the culture, the traditions, the history, the folklore, the languages, and the customs. I dress as a local when I am there. I eat whatever they eat. That has been very interesting at times. I thought of the other country I love this week as I have prepared to teach this Sunday on the biblical significance of the "Throne." 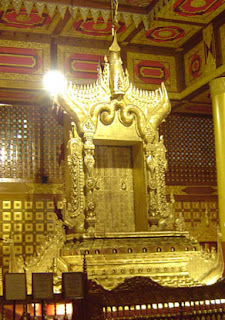 This pic I pulled from the net is of the Lion Throne. It was the seat of judgment for the king of Burma in the last half of the 19th century. Only the king was allowed to sit on the throne. No one else, ever, even if the king was absent. No one else had the authority to sit in that seat, to make the rulings he made. The throne is the symbol of the sovereignty that comes with the title. From the promise of God to David in II Samuel to the New Heaven, we can see in scripture many aspects of the authority of the throne. Scripture tells us that It is God who places kings on their thrones (Romans 13:1). Because of this, we know all authority of any government belongs to God. There are always people within and without of any nation that do not want to submit to or recognize the ruling authority of a nation. This does not take away the authority they have received from God. As a matter of fact, it puts guilt upon those that refuse to recognize the authority. The most serious violation of this principle is the failure to recognize the King of Kings. Those that are not part of the kingdom and refuse to acknowledge His authority bring further judgment upon themselves. Those who profess to be a part of His kingdom, yet by their actions deny His authority, run the risk of proving they are not really one of His. No one else could occupy His throne. Seeing the gorgeous, golden Lion Throne is phenomenal. Wait until we get to see the throne from which the river of the water of life, that is as bright as crystal flows from. How's your school, pardner?Check it out here.